To say the new Homefront game has endured a troubled development would be putting it lightly. Something the studio ultimately responsible for the game would like everyone to know once/if they ever finish Homefront Revolution. Even this first-hand explanation sells the chaos short. 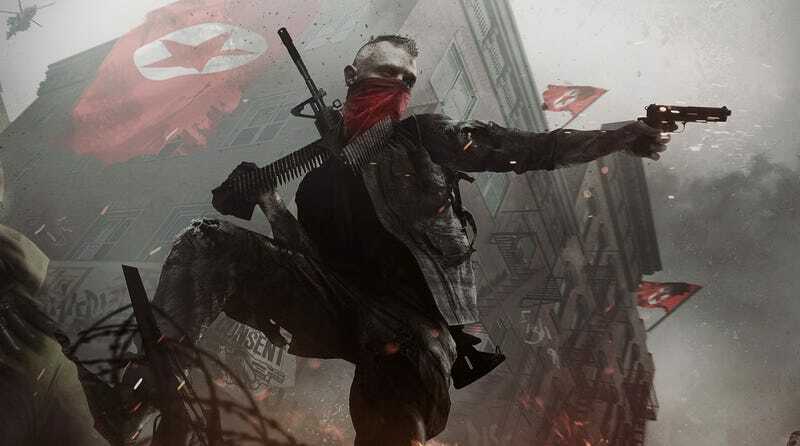 First, the developers of the original Homefront closed. Then the series was moved to THQ Montreal, then Crytek UK. Then publisher THQ closed, and Deep Silver picked up the tab. Then Crytek UK ran into financial issues, which led to many involved in the game’s development—including Hasit Zala himself—to walk out. *deep breath* Then Deep Silver’s parent company Koch Media stepped in, bought the property, set up a new studio and delayed the game from 2015 to 2016. Zala returned to head up development once more. So when he says “the path has not always been a smooth one”, he’s not kidding! Still...it’s a weird thing to greet a player once they finish the game. I can’t remember ever seeing anything like it, at least so prominently (some games will hide frustrations in the code, for example). On the one hand, it’s nice that players can get some kind of appreciation for the troubles this game encountered, and maybe realise that it’s a miracle this game ever made it out of development hell at all. On the other...the game’s not doing too well critically at the moment, so this might also be seen by some as a kind of excuse. Me? I haven’t even played it, so what do I know. But I do think it’s cool that they’ve gone to the trouble of tracking down everyone involved in the game’s development, regardless of studio or publisher, and thanked them all. Not every game has been so kind in similar circumstances.